The dead hands of the EU Bureaucracy and Corporatism are starting to intrude into the freedom to blog unencumbered as an individual. Rather than jump through their combined conspiratorial hoops I shall therefore be removing the Amazon links from which I derive little or no benefit anyway. Somehow those two bloated leviathans have managed to skew the relationship between the service they provide and the customer. 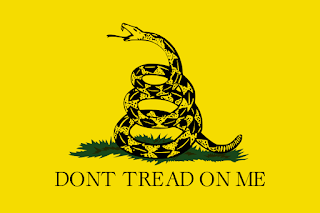 The British government, rather like its EU masters, is suffering from the delusion that we the people have become employees in a corporation that they control or pupils in a (primary) school that they run, and subject to their ever increasing, intruding and tedious rules and regulations, codes of behaviour and general nannying. 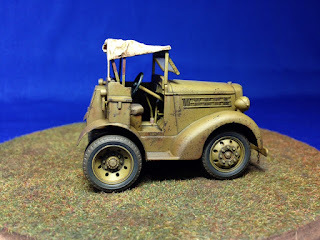 Dan Salamone has very kindly shared these images of two of his recently completed 1/48th scale Japanese airfield vehicle projects. The Army Isuzu TX40 airfield tug (above) was converted from the Hasegawa 1/48 cargo truck version. 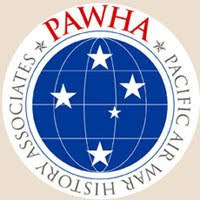 Dan started this project back in 2012, and based it on an image showing two of these vehicles on the tarmac at Hamamatsu airbase towing Ki-21 bombers. 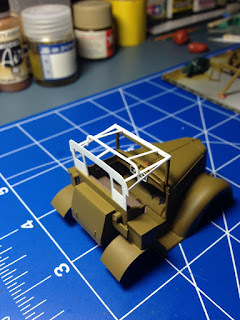 The conversion involved narrowing the cab and bench seat and scratch building the rear fenders, left door, equipment bins on the fenders and rear of the vehicle, as well as shortening and detailing the frame and tow hitch. 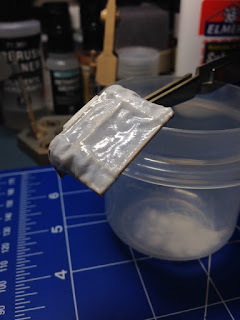 Dan also scratch built the roof by building up a frame with plastic rod and strip, then covering it with tissue soaked in white glue. 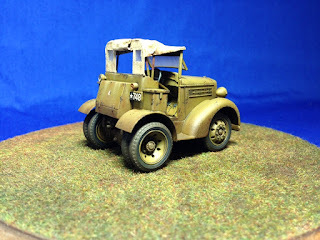 The vehicle was then airbrushed with a custom mix for IJA khaki, using Vallejo acrylics. The roof was sprayed with Tamiya paint, weathering was done with Vallejo washes and artist's oils. 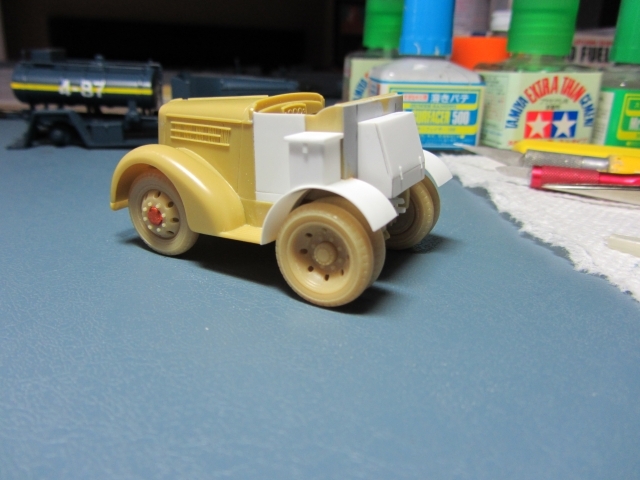 The final clear coat was Gunze matt lacquer. 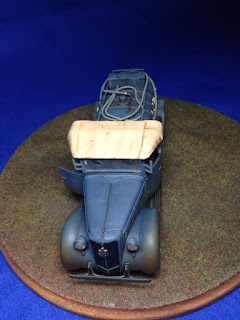 The result is an excellent and unique model of an interesting vehicle, although Dan hasn't indicated whether he plans to build a 1/48th 'Sally' bomber to go with it! 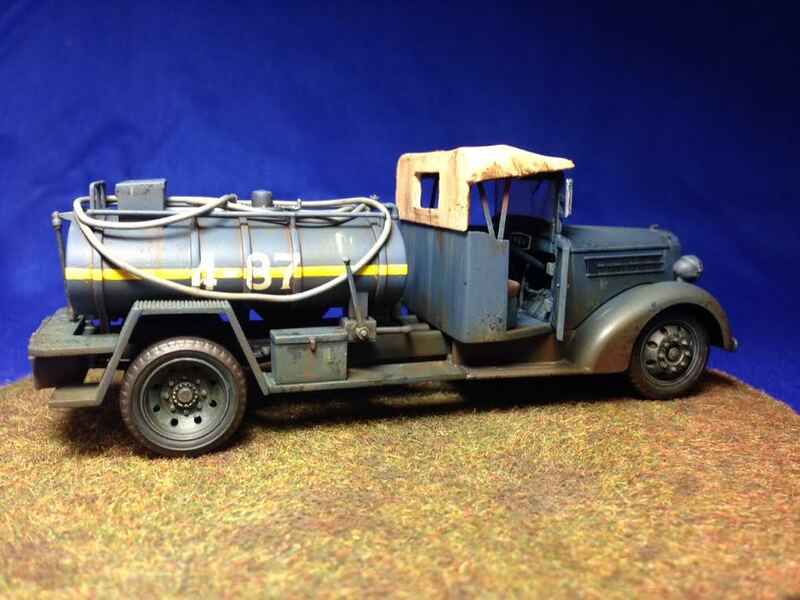 The splendid looking IJN fuel truck model (above) was made from the 1/48 Hasegawa Isuzu Type 97 kit, built pretty much from the box. Dan covered the roof with tissue soaked in white glue to give the appearance of canvas. 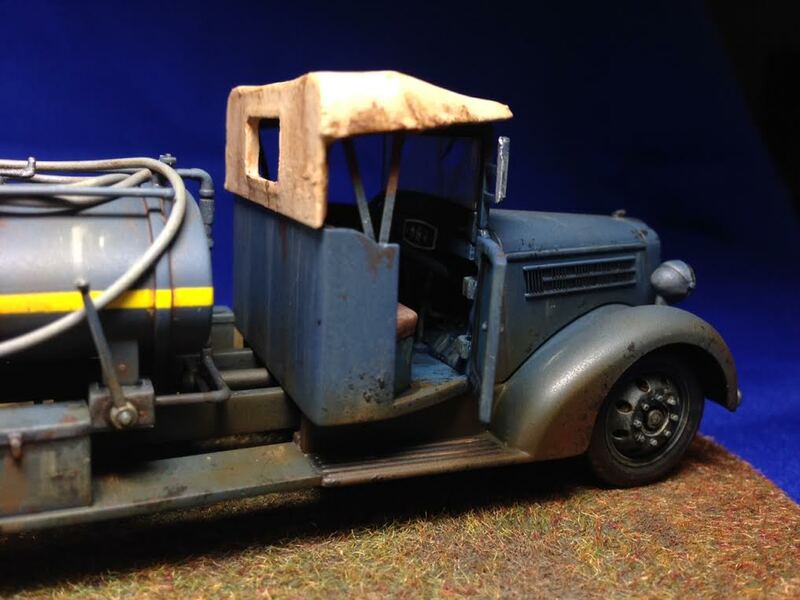 The model was finished with Tamiya paints from spray cans, weathered with Vallejo acrylics and artists oils. 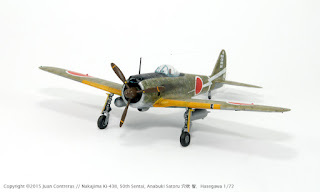 Dan noted that IJN fuel trucks usually displayed a light colored lateral band around the fuel tank and comparing those with aircraft in photographs, concluded that the band was most likely yellow. 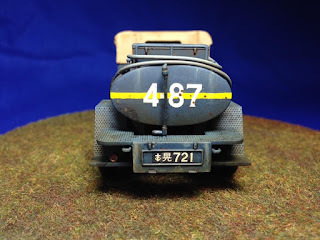 Some units displayed numbers on the tank as well, with the first number identifying the vehicle and the second number indicating the octane of the fuel it carried. IJA fuel trucks did not show the colored bands or the numbers, but almost every image Dan has seen shows a canvas tarp covering the fuel tank. This particular vehicle is patterned after images of trucks used by the 302nd NAG, based at Atsugi. 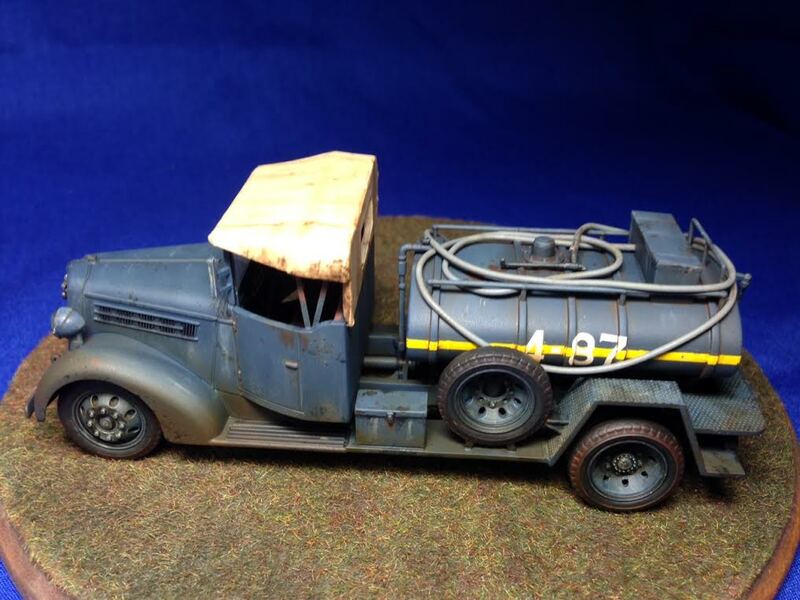 With special thanks to Dan for sharing these images of his superb pair of airfield vehicles. An inspiration. 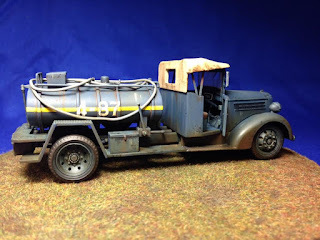 Two new and one recent resin sets from Rising Decals in 1/72nd scale offer opportunities to model interesting variations on some well known Army fighter types. 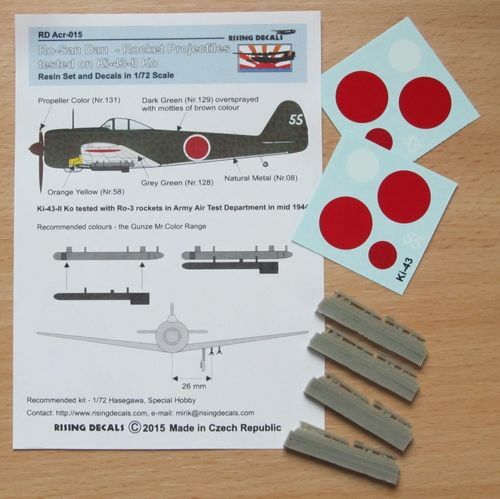 Each set contains a small decal sheet appropriate to the subject and they are priced at £4.99 each in the UK. 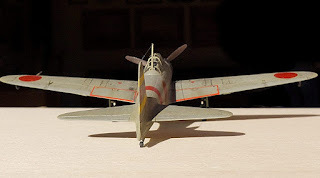 RD Acr-015 is a welcome set of Ro-San Dan (Ro-3 ordinance) experimental air-to-air rockets for the Ki-43-II with markings for aircraft '55' of the Army Air Testing Centre in mid-1944. The set consist of four resin rails and separate rockets to be installed two to each wing on the Hasegawa or Special Hobby kits. The test aircraft displays an unusual camouflage presumed to be a well delineated dark red-brown mottle over dark green. A photograph of this aircraft may be seen in a 2009 Aviation of Japan blog here. The camouflage might also have been a dark green mottle over a light brown or lighter green base colour. The decal sheet consists of white-bordered Hinomaru in six positions and the white numerals '55' for the rudder. Colours of the rails and rockets are unknown but are shown in what appears to be grey and black respectively. 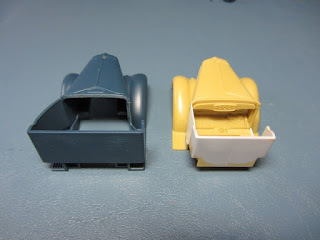 RD Acr-021 is a replacement resin cowling with individual exhaust stacks for a late production Ki-44-II Hei intended for the venerable Hasegawa kit, filling a gap in a Shoki variant line-up. The exact number of Hei machines produced with these individual stacks is unknown but photographs of them are rare and decals are provided for the only known example, an aircraft said to be from the 70th Sentai photographed at the naval air base at Iwakuni, Japan in September 1945. 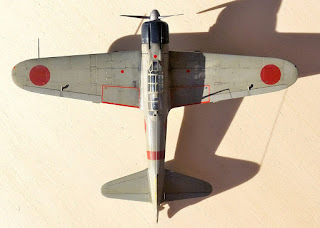 It is possible that the rudder was taken as a replacement from another aircraft belonging to that unit but according to Richard M Bueschel* the 70th received a few aircraft of this type and one was flown by the commander of the 47th Sentai. The individual 'jet' exhausts were first installed on the Ki-44-III prototype, a modified Ko manufactured in June 1943 and in production the Ko version of this variant was expected to have an increased wing area, enlarged tail, Ha.145 engine with four-bladed prop and Ho 5 20mm armament in the fuselage and wings. 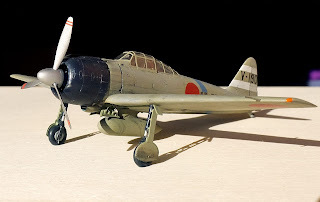 The Otsu version was expected to carry Ho 203 37mm armament in the wings but neither went into production, presumably their need supplanted by the Ki-84. Although the badly worn colour scheme is suggested to be 'Dark Green (Nakajima)' (Gunze 129) in the instructions an alternative possibility is the late war olive brown # 7 colour. 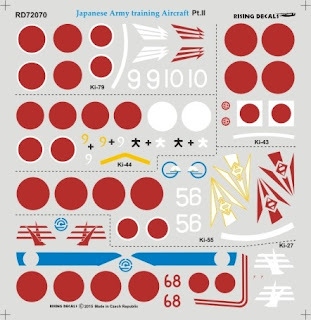 The decals consist of Hinomaru in six positions, a white senchi hiyoshiki fuselage stripe and the full 70th Sentai insignia in red. 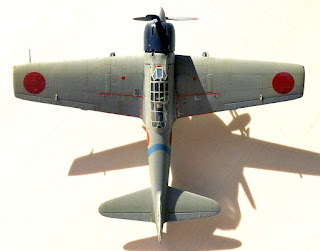 Curiously when artist K Hashimoto drew the Ki-44-III profile plan for the older FAOW series he depicted it with the individual exhausts configured in two sets of three rather than the 1, 2, 3 configuration seen in the Iwakuni photograph, even though that photo was included in the book. RD Acr-024 consists of two replacement resin cowling panels to model the Ki-43-II Kai using the Special Hobby Ki-43-III Ko kit. 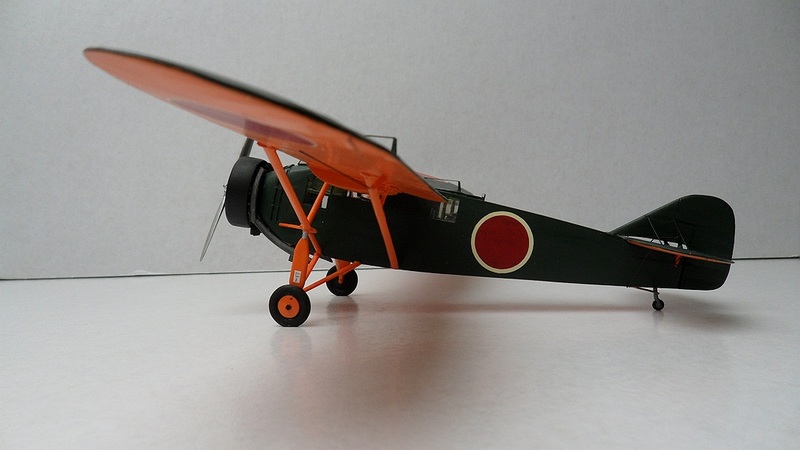 The cowling front from that kit will be needed so using this set with the Hasegawa kit would require some ingenuity and fettling. The individual exhaust stacks on the Nakajima-built II Kai were in a different pattern to the Tachikawa-built III Ko, with a distinct single upper stack curving downwards, but the two versions have often been confused, especially as late production II Kai also had the water-methanol system installed with filler spout under the cockpit canopy. 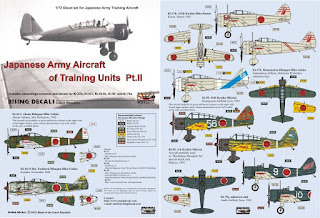 Decals are included for an aircraft presumed to be from the 31st Sentai as photographed at Clark Field in the Philippines in the summer of 1945. The 31st was originally a Ki-30 'Ann' light bomber unit established in August 1938 from a re-organisation of the 5th Flying Battalion. 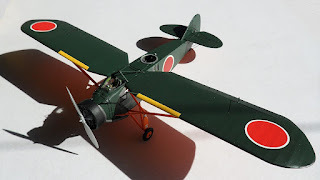 The unit served over Thailand and Burma at the start of the Pacific War, then in July 1942 was withdrawn to Tunhua, Manchuria as part of the 10th Air Brigade (together with the 27th Sentai) and the following year began converting to a fighter unit equipped with the Ki-43. 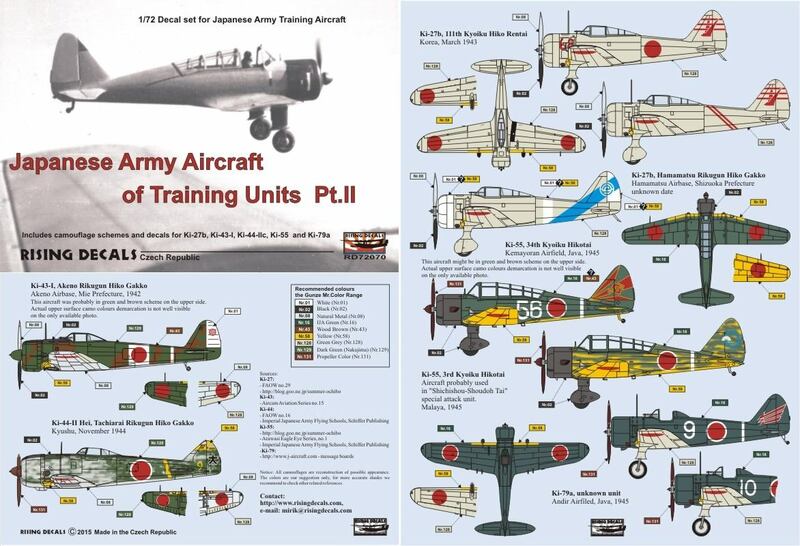 The unit was subsequently transferred to the Philippines (along with other units of the 2nd Air Division) to become part of the 13th Air Brigade ostensibly together with the 29th and 30th Sentai. The transfer of units from Manchuria to the Philippines was started towards the end of May 1944 and completed by early July. The 29th Sentai, which had re-equipped with the Ki-44, was detached from the Brigade and transferred directly from Manchuria to Formosa in July 1944. At the beginning of the Philippines invasion the 30th and 31st were based at airfields around Clark but thereafter their status and operations become uncertain. 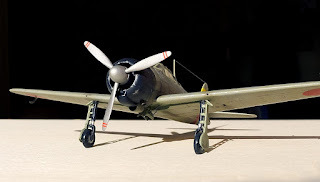 4th Air Army Operations records suggest that they were operating with very small numbers of aircraft and were not only probably consolidated together but perhaps with other Ki-43 equipped units. The 31st Sentai insignia of a lightning bolt was said to be red for all aircraft with the Chutai (squadrons) distinguished only by the number of horizontal white stripes displayed behind that - one for the 1st, two for the 2nd and three for the 3rd Chutai. However, the absence of white stripes on this Ki-43 suggests that the Chutai designation system might have been changed or that the number of aircraft available for operations precluded the need to distinguish the Chutai. 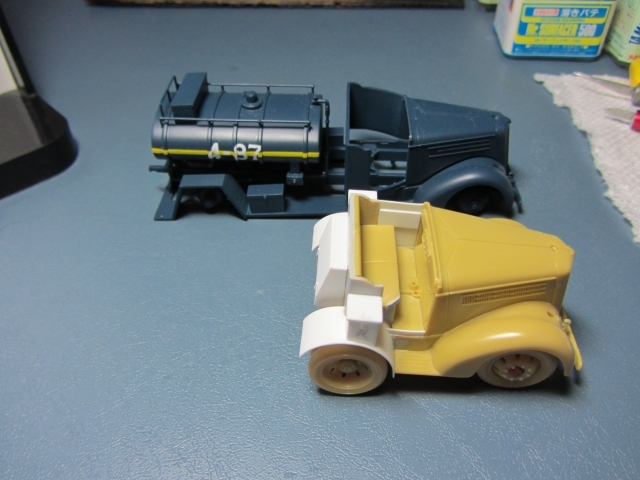 With special thanks to Mirek of Rising Decals for providing these sets for review. Ki-27 of 111th Kyoiku Hiko Rentai (Educational Air Regiment), Korea, 1943 - two options are provided, for an aircraft with numerals '68' on the nose and wheel spats removed and for an aircraft with twin fuselage stripes, both in overall grey-green and sporting the unit insignia in red on the tail. 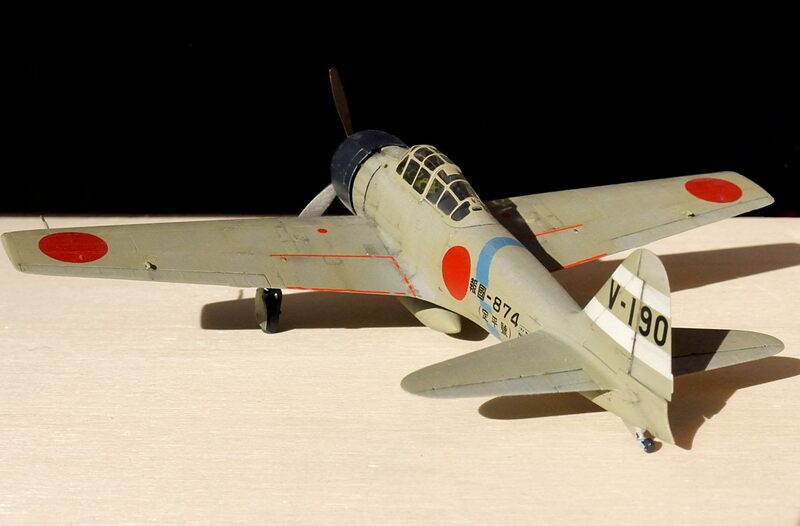 Ki-27 of Hamamatsu Rikugun Hiko Gakko (Army Flying School) - this striking Ki-27 is based on a monochrome photograph so the colours are necessarily speculative. 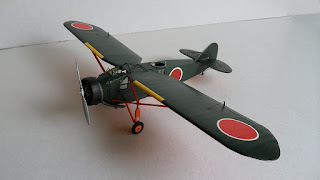 It is unusual as Hamamatsu was principally a bomber training school. It might be the personal runaround of the establishment commander or perhaps used for 'bounce' training of air gunners. The school insignia was usually white, red or yellow. Ki-55 of 34th Kyoiku Hikotai at Kemayoran, Java, 1945 - a field camouflaged trainer with elaborate tail insignia and large white numerals '56' on the fuselage. Note that although shown as such in the profile the actual aircraft was not fitted with wheel spats (hat tip to Jacob Terlouw). Ki-55 of 3rd Kyoiku Hikotai - another training aircraft in a field camouflaged scheme of streaky green over the original yellow. 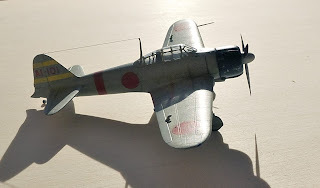 This unit was previously designated the 103rd but the tail marking is associated with their Ki-51 special attack unit - Shichishou-Shoudoh Tai - and might not be the original training unit marking. The kikusui (floating chrysanthemum) emblem is associated with special attackers. 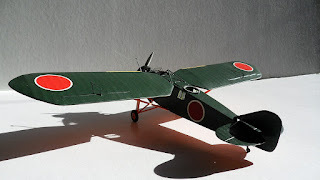 Although this particular aircraft has been reported as being at Gifu, the 3rd was part of the 107th Kyoiku Hiko Dan which came under 55th Kyoiku Hiko Shidan HQ at Singapore. It was also known as Oka No.15315 Unit and was an Army Co-op training unit based at Taiping in Malaya, operating the Ki-36, Ki-51 and Ki-54. 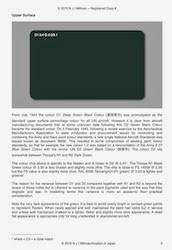 According to one source the circle marking was painted in Chutai colours. Ki-79a of unknown training unit at Andir, Java, 1945 - two options are provided, for aircraft with alternative white fuselage numerals '9' or '10'. Both have the unit tail insignia of three stylised red arrows. 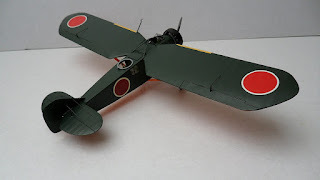 Ki-43-I of Akeno Rikugun Hiko Gakko, Mie Prefecture, 1942 - this fighter trainer is depicted in green and brown camouflage with a white painted rudder and white rectangular background to the fuselage Hinomaru. 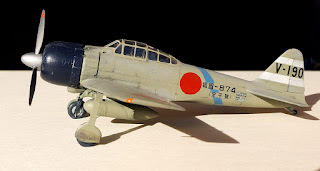 Ki-44-II Hei of Tachiarai Rikugun Hiko Gakko, Kyushu, 1944 - Although Tachiarai was not notionally included in the scheme this Shoki was possibly prepared as an air defence fighter of the Tõ Ni Go Butai (Secondary Provisional Units) flown by instructors and test pilots at air training and testing establishments during bombing raid alerts. 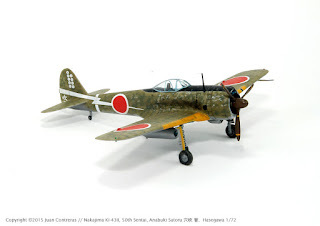 It has the flying school insignia of the kanji character 大 ('ta' for Tachiarai) on the rudder and the yellow trim associated with those units in the form of a diagonal fuselage band and fin/rudder stripes combined with a very worn looking camouflage finish. This is yet another excellent sheet from Rising Decals offering some interesting and unusual alternative schemes for popular Army training aircraft models. Army training unit nomenclature and organisation can be confusing but fighter training units were designated processionally upwards from Renshu Hikotai, (approx. Training Transformation Air Unit) which provided basic flying training in dual control biplanes, to the subsequent Kyoiku Hikotai (approx. Educational Air Unit) where students flew the Ki-27, its single and two seat trainer variant the Ki-79, and the fighters they would eventually fly in combat such as the Ki-43 and Ki-61. Finally in the Rensei Hikotai (approx. Learning Air Unit) student pilots received advanced operational training and were taught combat tactics such as the rotte system. The Rensei Hikotai were frequently used to provide an auxiliary air defence capability. 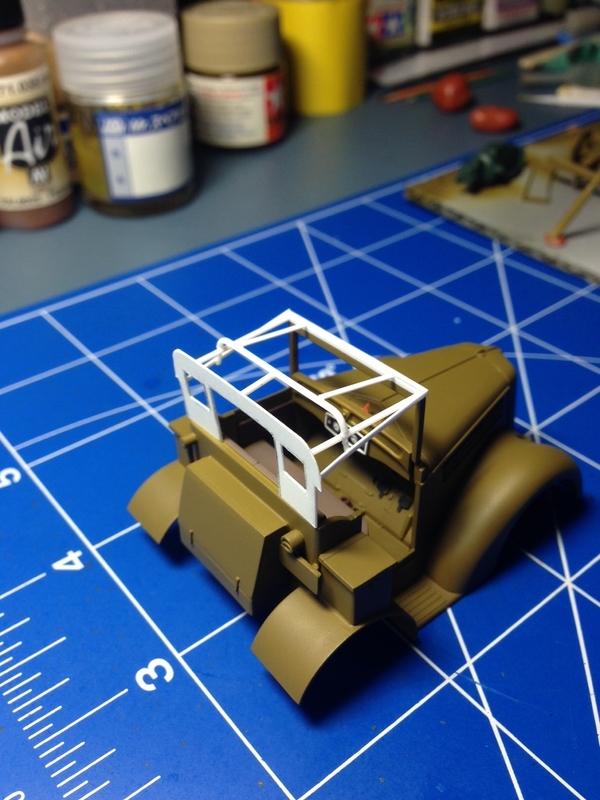 With special thanks to Mirek of Rising Decals for providing the review sheet. Inspired by recent Zero blogs here Danilo Renzulli has kindly shared these images of his own two Zero models in 1/72nd scale, both depicting slightly weathered finishes. The A6M2 is the second generation Hasegawa kit whilst the A6M3 is the more recent Tamiya kit. Both built OOB except for the addition of some cockpit and rivet detail. Danillo tried to replicate the rivet texture on all surfaces and accepted the challenge of painting both models in the elusive amber-grey colour. The final result shows how tricky the colour is - just a change of light and the amber-grey immediately looks either a bit more greenish or more yellowish! 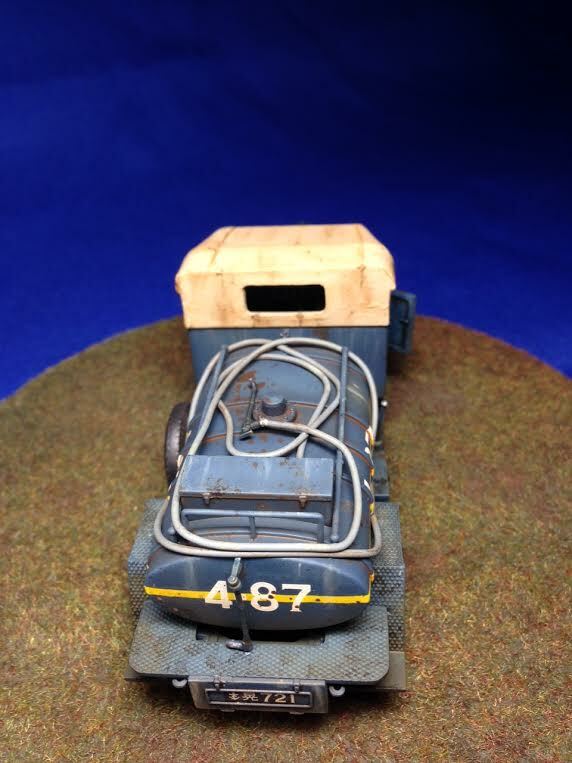 He used a mix of Humbrol paints: - 28 Matt Camouflage Grey, 62 Matt Leather, 86 Matt Light Olive and 99 Matt Lemon without noting the proportions used, simply adding the various colours until satisfied with the appearance of colour in the jar. 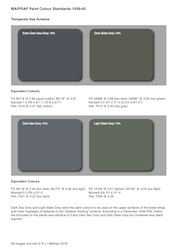 28 played the major role being both of a light and warm grey hue. 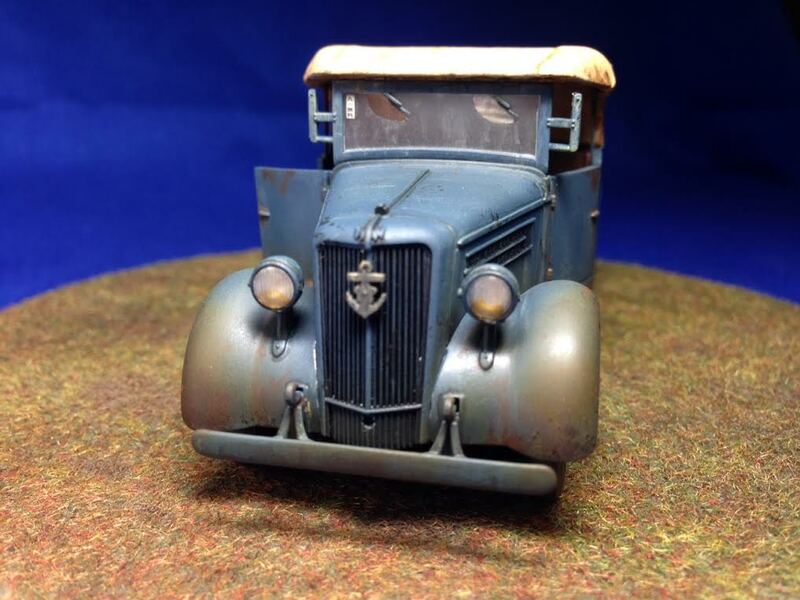 The partial chalking effect here and there was achieved by replacing the grey paint with some White 34 in the above mixture, then dry-brushing the model with a flat soft brush. 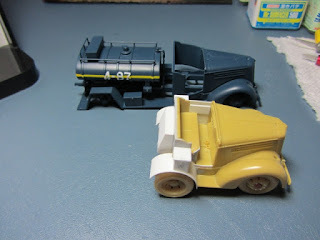 The same mixture was used to paint the fabric surfaces on the amber-grey base. The Hinomaru and all the coloured stripes were air brushed. Danilo observes that the Tamiya kit is so well detailed that he only had to add a few photo-etched parts in the cockpit. 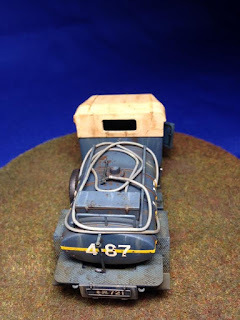 He describes it as a fantastic model, going together with no problem and with no need for any putty at all, for the first time in his long modelling experience. 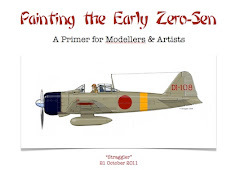 The models were weathered with a diluted mix of black and red, and a silver pencil. 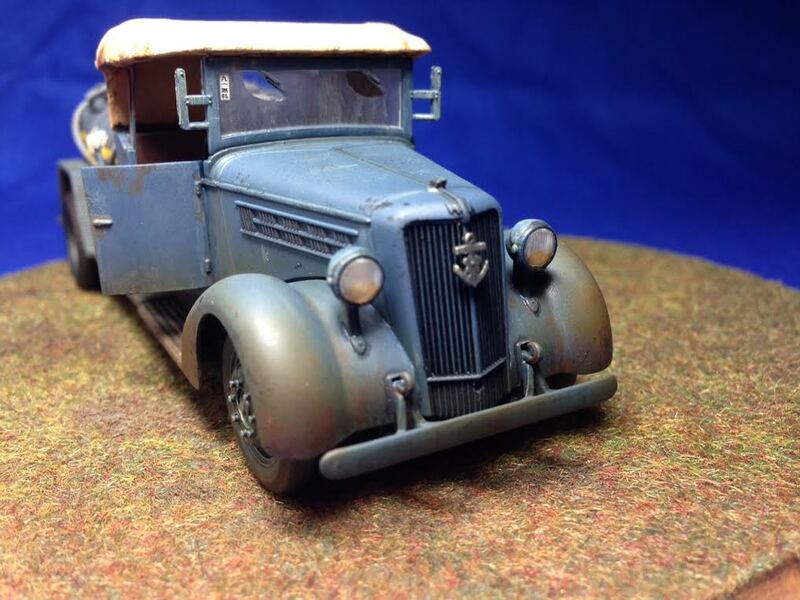 To avoid affecting the weathering and overall finish he didn't apply any protective coat or transparent varnish. The "no walk" and prop blades stripes were from some sheets of transfer lines that he has jealously kept since the 1970s! 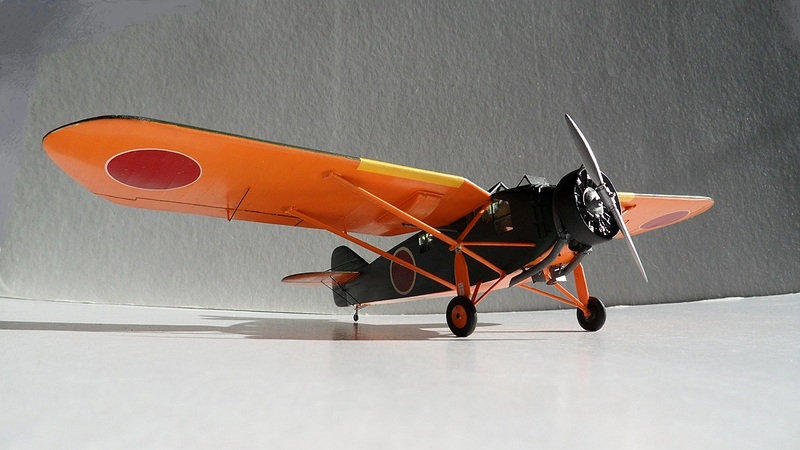 With special thanks to Danilo for sharing these images of his excellent Zero pair. John Haas very kindly shares these images of his latest 1/48th scale scratch built model of the Mitsubishi K3M3 'Pine' (Navy Type 90 Land-based Crew Training Airplane - 海軍 九〇式 機上作業練習 機), something of a departure from Zekes and Oscars - and there were no 'Pine' Aces that I know of. At first John thought that building this model would be smooth going the whole way as it resembles a Fokker Universal. How wrong he was! It turned out to be a rather complex model to build with that strange construction of the cockpit floor lined up between the side windows. He was unable to find many clear photographs and hardly any interior drawings. The most difficult part was how to securely fix the relatively large and heavy wings to the small edge of the fuselage. 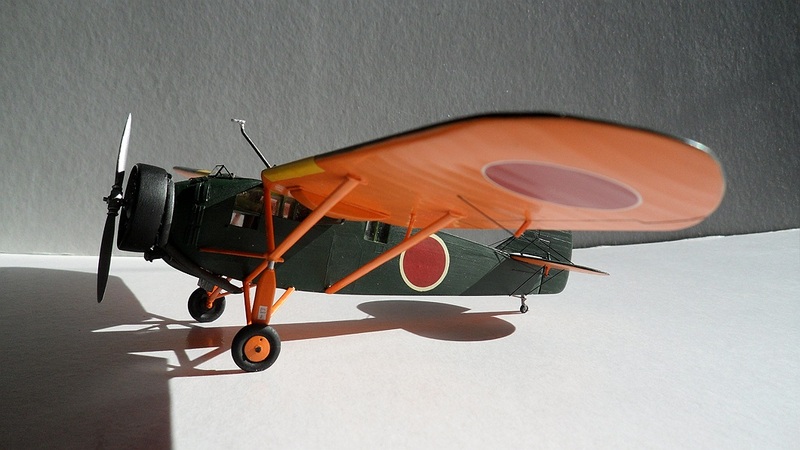 In this case the wing-struts really act as support for the wings. 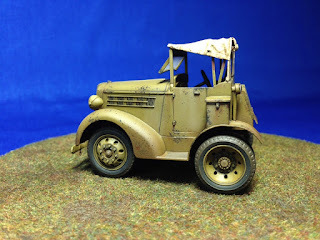 The 1/72 AZ Models K3M3 kit with all parts provided is far from being a straightforward construction so John's achievement is all the more remarkable for being entirely scratch built. At the end John was happy with the result, considering it not perfect, but giving a good impression of this special aircraft. I'd be happy with this from a kit - let alone scratch built! 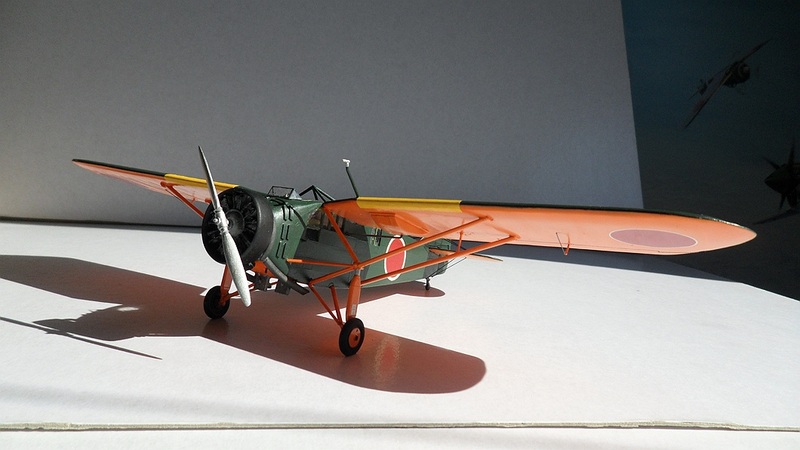 John's model is finished in the wartime scheme of deep green black upper surfaces which were gradually applied to aircraft in the overall orange yellow trainer scheme from July 1943. 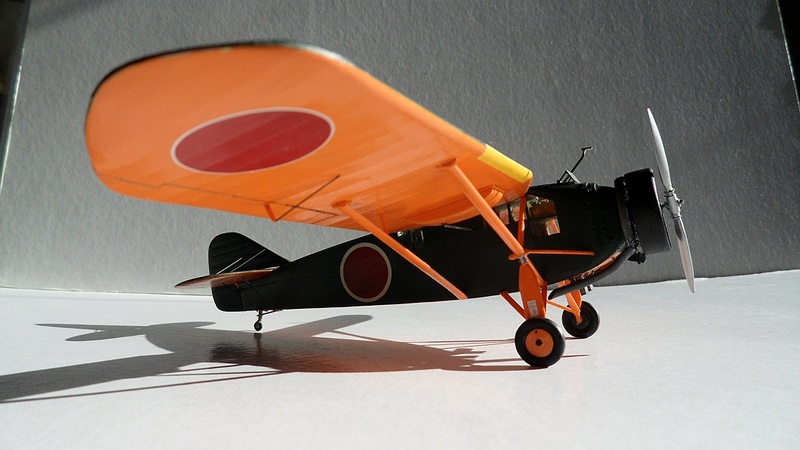 This aircraft originated in a 1928 Mitsubishi private venture to provide a cohesive multi-crew trainer for navigation, wireless operation, air gunnery, bomb aiming and photo-reconnaissance functions. 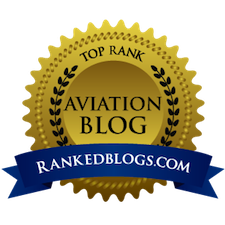 The idea was that several aircrew trades could learn their skills in a single training flight under the auspices of an instructor. The resultant wooden biplane M-13, designed by the expatriate Sopwith engineer Herbert Smith, attracted no official interest but the concept of a multi-crew trainer was established when the Mitsubishi designer J. Hattori designed the Ka-2 the following year and the Imperial Japanese Navy ordered two prototypes. The first prototype was constructed with a liquid-cooled engine and despite problems with vibration and stability this type of power plant was persisted with up to the fourth prototype with various airframe improvements designed to alleviate the stability issues. 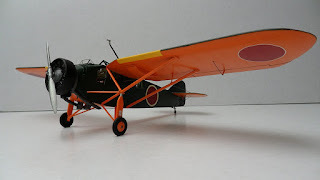 With the installation of a Mitsubishi air-cooled engine the design was officially accepted as the Type 90 Model 1 Crew Trainer with production of 70 examples from 1932 to 1935. In 1938 performance was enhanced to reduce flight training time by the installation of a Nakajima Kotobuki engine and airframe refinements. 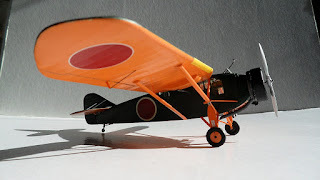 In this form as the Type 90 Model 2 Land Flight Crew Trainer (later re-designated Type 90 Land Crew Flight Trainer Kai) the design soldiered on until the end of the Pacific war, with 245 examples manufactured by Aichi Kokuki from 1938 to 1939 as the K3M2 and 301 examples manufactured by Watanabe Tekkojo as the K3M3 from 1939 to 1940. With special thanks to John for sharing these images of his impressive model. 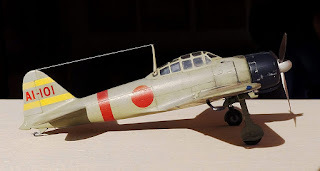 This splendid Ki-43-II model built by Juan Contreras from the Hasegawa kit demonstrates both its basic fidelity and his skill. The model represents the controversial 50th Hiko Sentai ace Satoshi Anabuki's Fubuki (吹雪 - Snowstorm or Blizzard) in a personal but convincing interpretation of camouflage which has been variously depicted over the years. Juan's model wears a similar scheme to the Rikyu Watanabe artwork of Anabuki's Kimikaze (君風 - Imperial Wind) gracing the cover of 'Japanese Army Air Force Fighter Units and Their Aces' (Grub Street, 2002). 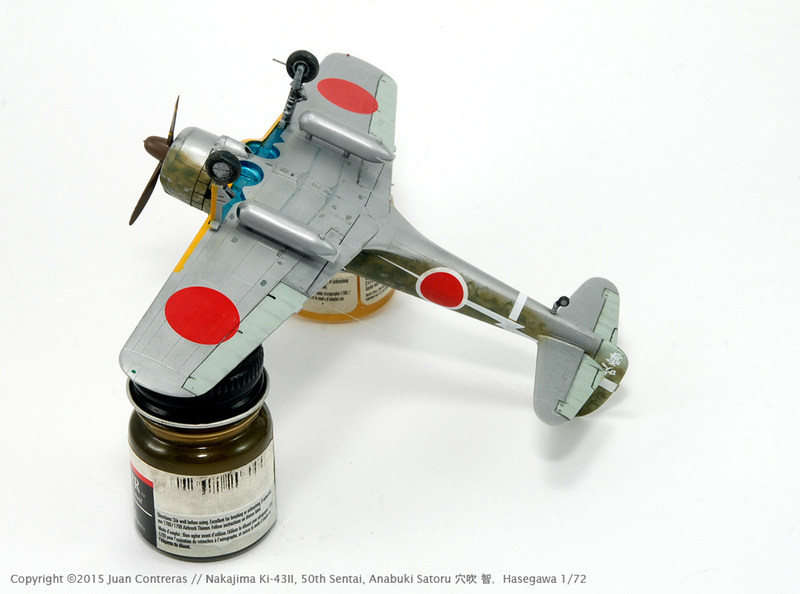 Juan used Vallejo Model Air paints for the camouflage, representing the dark green over dried grass colour with 71.043 Olive Drab and 70.610 IJA Karekusa iro, with Tamiya and Mr Color (GSI Creos - Gunze) paints for everything else, except the spinner hub, which is White Ensign Colourcoats paint. 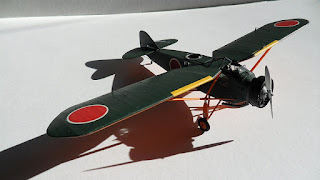 When the 1/72 Hasegawa Hayabusa was first released in 1982 the instructions for Anabuki's aircraft called for a mottled finish of "khaki green spots on dark green" using the old Gunze paints # 15 (dark green) and # 55 Khaki (ka-ki カーキ). The box art by Shigeo Koike depicted a rather indeterminate mottled scheme of dark and light greens. 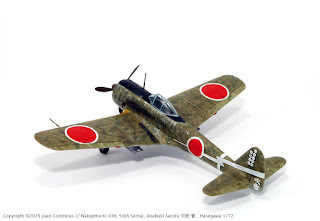 Rikyu Watanabe's cover art depicted Kimikaze's camouflage as a more regular dark green mottle over a solid base of dried grass colour - a slightly greenish sand brown. There is a complication (and digression) here in that the IJAAF paint colour standards included both Kaki iro - 柿色 - which actually means persimmon colour - an orange brown - and Karekusa iro - 枯草色 - the dried grass colour. Ka-ki colour カーキ色 (Katakana) and Kaki colour 柿色 (Kanji) are distinct and different. 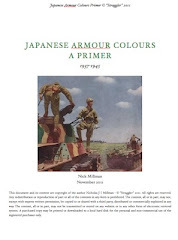 The former now covers a broad perception from the wartime drab brown Japanese Army colour to a more modern greenish khaki, often approaching an olive green. The persimmon colour included in the IJAAF standards is a much stronger orange brown. But there is the potential for much confusion. Further complications arise from the colloquial tendency to describe khaki as dried grass colour and vice versa. 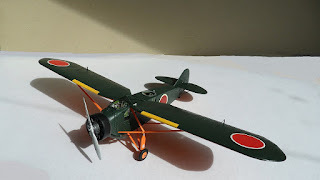 With the re-issue of the Hasegawa kit in 1987 the instructions for Anabuki's aircraft were revised to suggest a dark green mottle over natural metal finish, probably based on an interpretation of photos showing Anabuki standing by his aircraft or in the cockpit at Akeno. 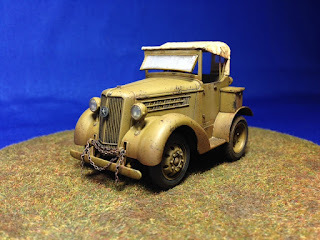 With special thanks to Juan for sharing these images of his excellent model.